Everyone has their own beliefs and their own method of dowsing. What works for you is probably correct and a most important aspect is that you should feel comfortable with it. Over the years I have picked up tips and ideas from others as well as developing some of my own. This has enabled me to sharpen up my dowsing methods, so here are some of those tips and ideas, it is then up to you whether you accept or reject them. So what are the “tools of the trade”? Such items as angle rods, pendulums, forked hazel twigs etc., are all familiar and I do not intend comment on them. I frequently use finger dowsing , hand feeling, “audio”, visual perception, and just getting a “kick”. With finger dowsing, rub your first finger and thumb together; most times for me I get a “sticking resistance” for yes and a “slipping” for no. It can take some time to acquire this skill but once one has it I have found it exceptionally useful. With hands behind one’s back whilst being shown something enables one to dowse unnoticed. Try it! One word of caution here, do be aware that at any time your yes/no dowsing signal can reverse, especially when carrying out adjustments. This applies to all dowsing methods. When I dowse, after a moment I frequently get an “audio” result, or “knowing”, like someone talking to me. I can then discard my dowsing instrument and record what I am being told. Frequently, if I am not quite sure, I then check that what I received was correct by means of that dowsing instrument. I believe that one can dowse (with permission) at any time. However this was not always the case, as I have been told such things as “You cannot dowse at night”, “You cannot dowse during an eclipse”, etc. etc. Rubbish!! Many of us have very effectively dowsed on those occasions. However be aware that some energy lines do change their direction of flow at dawn and dusk, so dowsing on those items at those times can lead to errors. In my earlier years of dowsing, I believed that “I” was doing it all, but I didn’t always get the correct results ! Now I have adopted a different method. I ask permission to contact the “Universal Consciousness”, “The Management”, “Upstairs”, or whatever is your belief system. Through me, they do the work and give me the answer through whatever “equipment” I am using for dowsing. You may think that this is cheeky but those in contact with the Spiritual World will tell you that they love to be involved. I believe that I get better answers this way, however each person must find their own way, what is right for one may not be right for another. “Can I ?“ (do I have the ability and am I ready), and “May I ?“ (may I have permission to enter and/or dowse). This is something I feel strongly about. It may be for your protection if you get a “no” or for some other reason. One example of an incident which happened to me was at Knowlton Rings in mid-September 2002. I arrived and asked for permission to dowse there before entering. “Can I ?“ – “yes”, “May I ?“ -“no” !. That latter answer surprised me! “Is there a reason ?“ – “yes”. Then I looked up and saw hundreds of migratory birds circling around above the rings. I then established that they were building up their energy reserves before flying off to warmer locations many miles distant. My dowsing on that site at that time would have affected their abilities to reach their distant destination. The following day “no problem”. Always keep an open mind and be prepared to meet the unexpected. When dowsing at an ancient site, etc., I always keep notes which include the date, time, BST or GMT, and often the moon phase. (This last item can alter some site energies.) In some cases I record general atmospheric conditions. When one arrives at a site which has had many changes over the years, how can one easily separate the various “stages”. Firstly I dowse on how many “stages” or dates I should examine. Then I dowse those actual dates, asking to be shown when a “stage” was at its peak. Having established the actual dates, in order to keep my mind centred on a particular date when dowsing that site at that date, I attach a card, on which the date is marked, to a wooden stick and push it into the ground at the site. I usually start with the earlier dates and progress through to the later ones. This is then enables me to build up a history of that site and understand how it has developed over the years. Before driving in my car to a distant destination, I dowse the best route to take, also from time to time I finger dowse as to any problems ahead. If you are caught in a traffic jam, probably there is nothing you can do about it, so don’t get worked up and frustrated, just dowse (fingers) how long you will be there or held up and relax. I sit back and listed to a relaxing or favourite tape, but do not go to sleep ! Keep aware! Even whilst driving I have had a “kick” to slow down to 60mph when on the M25.This I did and arrived opposite an earlier convenient exit than that intended, just at the rear of a 16 mile traffic jam. So keep alert.! Before the last election I was holding my angle rods when on the TV came a party political broadcast. I was not paying attention when suddenly I noticed my rods moving, it didn’t take me long to establish that I had a truth/lie detector. Truth = inwards and lie = outwards and the relative rod angles graded the results as well ! I came to the conclusion that if the speaker thought they were telling the truth then that result would be indicated. I hate to tell you how often the rods were partially outward. Try it at the next election! I was refused permission to contact the individual Devas, instead I had 40 contact the “Boss Deva”. He now helps me with my vegetable garden – with surprisingly good results. When my wife was away, I dowsed cooking times, oven temperatures and gas mark numbers, etc., with wonderful results. Try it! I have used dowsing to find electrical cable locations and faults, gas and water pipe leaks, sewer blockages, etc. The list continues to grow. One Area Electrical Board had an Engineer who didn’t have to go to the cable fault site. “Fetch me a plan.” He then dowsed (e.g.) “The fault is 3 feet to the left hand side of the left gatepost of No.26.” It was there! With electrical equipment and other technical and scientific matters, it does help to know something about its mode of operation in order to fully comprehend the dowsing signals received. Do make contact with the Spiritual Site Guardian at ancient sites, they have shown me so much. Use the rods for guidance. 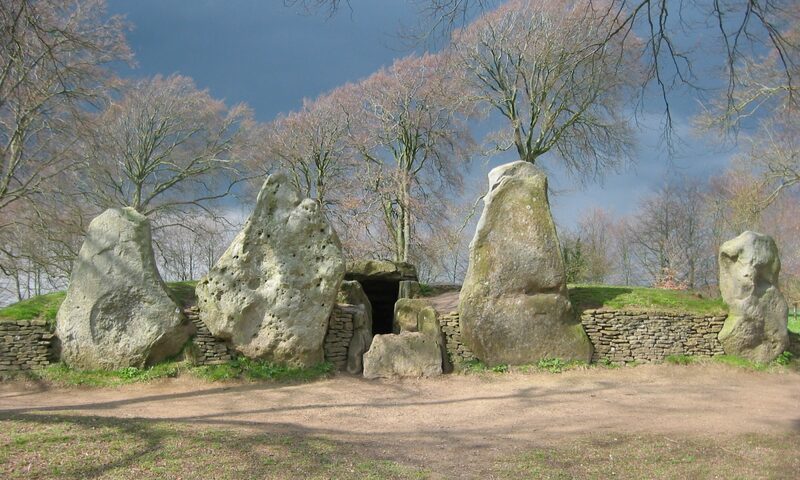 Torhouse Stone Circle is such an example. I was shown how the full Moon appeared cradled by three centre stones. It wasn’t until 15 years later that I learnt that it was a Moon site whose layout is derived from the Vesica Pisces. Do not make adjustments to a site, or anywhere else unless specifically asked to do so. If house adjusting, it must be at the request of that resident. If in doubt, ask “Upstairs”. I know of one case where, without permission, someone said “I have put your area right”. It took two weeks to get it back to normal and calmness. So please do not interfere unless asked. When dowsing look for some way to verify your results. For example; map dowse in imperial units and then site dowse in metric units. Go back to your car, get out the calculator and see how the results compare. Finally, keep notes, keep an open mind and be prepared to meet the unexpected. Dowsing can be fun, so keep it that way and enjoy it.